Extra long or XL twin mattress is a second standard size of mattress after regular twin with actual dimensions 39 inches (99.1 centimeters) in width and 80 inches (203.2 cm) in length. Total usable mattress area is 3120 square inches or 20,137 square centimeters. It is 5” longer and about 7% bigger in comparison with regular twin mattress size, but about 30% smaller than full (double) mattress. Placed in the corner XL bed with a twin mattress will allow to accommodate even bigger furniture in the bedroom. With a centered position it is still enough space for two nightstands and smaller drawer in the 10’x 10’ bedroom. In the total XL twin will occupy about 22% of a total bedroom area plus adding another 3% - 5% for bed frame. XL twin mattress is the best option for higher people, but still design for a single person whether it is an adult or teenager. With insignificant increase in size comparing to standard twin XL will suit in the smaller rooms and in larger bedrooms it is possible to accommodate two beds for children or guests. Typically twin beds are not practical in master bedrooms not because of its size, but usually couples will prefer to share one bigger bed instead of placing to two smaller. Extra long twin mattress will be slightly heavier comparing to regular twin, but much lighter than double size mattress with nearly the same heights. 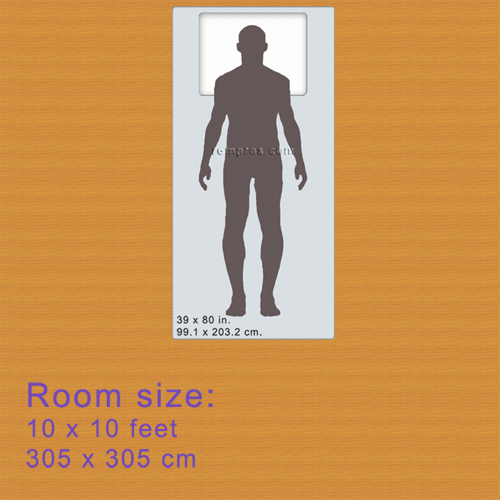 Dimensions of extra long twin size mattress were proportionally resized according to average men heights - 5 feet 10 inches (1.778 meter) and 10 x 10 feet (305 x 305 centimeters) bedroom.